1. Remove dough from machine and roll it into circles of approximately 8 inches. 2. Spread filling on one half of the circle leaving a border around it for closing. 3. Close the calzone by folding the unfilled side on top of the filled side and crimping the edges closed with your fingers or a fork. 4. Place on a lightly greased baking pan. Let rise approx. 5. 30 minutes. Brush lightly with olive oil and bake at 500 degrees for 20-30 minutes or until puffed and golden. 6. (I bake them at 485 degrees for 15 minutes in my oven). 7. 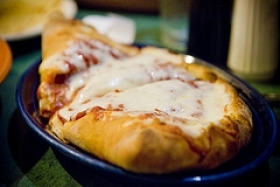 The original recipe says to put 1 1/2 to 2 tablespoons each or ricotta and grated mozzarella cheese in each calzone. 8. SPINACH FILLING : Saute thawed spinach in olive oil and garlic powder until all water has evaporated. 9. (I squeeze out excess liquid first) Mix cheeses into spinach. 10. You may substitute frozen chopped broccoli for spinach. This recipe is high in Vitamin A with 507% of your daily recommended intake per serving. This recipe is a good source of Vitamin C with 18% of your daily recommended intake per serving. This recipe is high in Vitamin E with 40% of your daily recommended intake per serving. This recipe contains potential food allergens and will effect people with Yeast, Gluten, Cheese, Olive Oil allergies.